When I say I went up to Turkana in the dry season, I am probably understating it a bit. It was in the thick of a drought. There hadn’t been rain for three years. Children were begging beside the road with empty Coke bottles. We had to take all our own water. It made it all the more frustrating to see animals lying dead beside the shores of the soda lake – all that undrinkable salty water. The only thing that was thriving was volcanic lava which lay strewn across the wasteland. I brought a piece back with me, thinking that locals could start a cottage industry selling pumice stone. It stained me black. It still lurks reproachfully on my bathroom shelf. Lake Turkana is exciting in a hell-mouth sort-of way. In the desert in the far north of Kenya, this is the largest and saltiest of the Rift Valley lakes. If full, it stretches 249 kms from north to south, is 44 kms at its widest point and up to 30m deep. Its total surface area is 70,000 sq kms (27,027 sq miles). Of this, 161,485 hectares (623 sq miles) is protected within three separate national parks – Sibiloi National Park, the South Island and the Central Island National Parks, which together have also become a UNESCO World Heritage Site, both because of their importance to wildlife and prehistoric heritage. The Turkana region as a whole and Koobi Fora, in particular, is one of the great treasure troves of palaeontology, offering up some of the richest evidence of man’s earliest roots from fossil beds well-preserved within the Rift walls. As far as wildlife is concerned, there are relatively few mammals around, but they do manage to survive. However, the lake is an important birding centre, with up to 350 species from local residents including pink-backed pelicans and flamingoes which thrive on the brackish water to many migrants which use it as a stopover en route to their European summer homes. It is also an important breeding point for hippos, several species of venomous snake and the world’s largest breeding ground for the Nile crocodile. Truthfully, this is probably not a collection most people would cross deserts to see, but the lake does have a real fascination, particularly when you throw in the local tribes people who have a festival each May. In this instance, wildlife takes backseat to the overall experience. Let’s get some of the ‘boring’ factual stuff out the way first. Firstly, Lake Turkana per se isn’t a national park. However, there are three parks on or bordering the lake: these are Central Island National Park, South Island National Park and, on the northeastern shores of the lake, Siboli National Park. Secondly, as far as large mammals, or in fact animals of any type, are concerned this is a disappointing area to visit. But, but, but for me, Lake Turkana vies with the Masai Mara for honours of the best safari experience in Kenya. It’s just that for Lake Turkana the reward isn’t in the wildlife but is all in the journey and the encounters en-route to the lake and once there. Located right in the far northwest of Kenya and touching the Ethiopian border, Lake Turkana, known more romantically as The Jade Sea, sits in a blistering hot desert bowl of shattered lava rock. Although you can fly from Nairobi to Lake Turkana that’s the least interesting way of getting there. For me the way to get the most from Lake Turkana is to give yourself 10 days to 2 weeks and go overland. There are three overland routes to the lake. 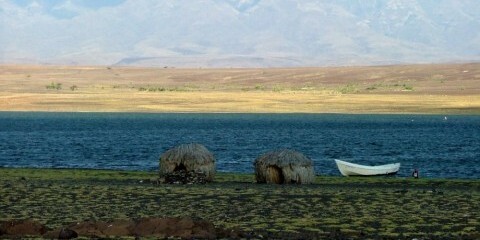 The easiest, but in my opinion least rewarding, is the route up the western side of the lake to the drab town of Lodwar. 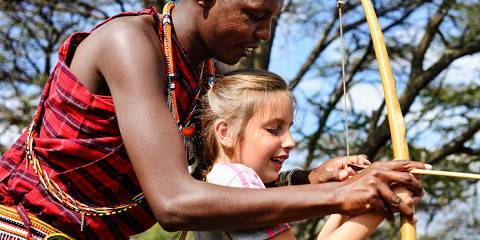 Far better is to do loop to and from the lake travelling via the bird filled Lake Baringo, the cool, green highland town of Maralal, the fascinating Samburu village of South Horr and on to the lakeside village of Loyagalani. For the return journey, head over the blank sands of the Chalabi desert through little North Horr with its camel herders and nomads, to the forested mountain town of Marsabit before heading south to the rest of Kenya via the Samburu Reserve. The going on this route is very tough, roads are dreadful, distances long, accommodation and food primitive but my oh my what rewards. After years of travel across much of Africa I can safely say that there are few areas on this continent that are as exciting to travel. This is a genuine wilderness experience of ever changing landscapes and, despite me saying this wasn’t a wildlife safari as such, there are some animals (north Kenya is actually the only part of eastern Africa where I have seen elephants strolling about outside of any protect area) with the lake itself being home to a massive population of Nile Crocodile which are easily seen on Central Island where they nest. But it’s the people that are of the real interest here. Numerous tribal groups, living largely traditional lifestyles live up here: the Samburu, Turkana, Rendile, Borana and more all call the north home. Over the years I have spent months exploring Lake Turkana and the far north of Kenya and everytime has been a real adventure. I’ve snapped my jeeps drive shaft twice on the terrible roads, climbed mountains with feather bejeweled Samburu moran, seen a baby elephant no more than an hour old in a forest clearing, had men with Kalashnikovs and spears pour tea leaves and soap into my jeep radiator at three in the morning (don’t ask! ), chewed miraa (a leafy stimulant commonly consumed in the north of Kenya) with Somali truck drivers, slept in Samburu and Turkana villages, followed goat herders about their day and ridden boats out to desert islands populated with zillions of giant crocodiles. A journey to Turkana won’t appeal to everyone but for those in search of a totally different kind of ‘safari’ experience and who are willing to face up to real, unpackaged, genuine adventure then a safari to Lake Turkana will leave you with unforgettable memories – it certainly has for me. Visiting Lake Turkana, the largest desert lake in the world, is a real adventure. For the cash-rich and time-poor, it’s a flight in a private light aircraft over the blistered earth below. For everyone else, it’s a couple of days of hardy overland travel from Nairobi. However you choose to come, your first view of the lake – a slash of iridescent jade, stretching down along the Great Rift Valley from Ethiopia - is one that will stay with you for a long time. There are three national parks at Lake Turkana: Sibiloi National Park, South Island National Park and the Central Island National Park. Much of the wildlife that you find here is fitting to the harsh landscape, including Nile crocodile, plentiful venomous snakes and scorpions. Mammals include zebras, hippopotamus, gazelle, hartebeest, lion and cheetah, though this isn’t the place to come to see big cats. Facilities here are few and you won’t meet many other travelers and that is the appeal. Traveling in a Landcruiser across bleak desert and past dramatic volcanic backdrops; encountering traditionally dressed nomadic pastoralists herding their camels; and sleeping in absolute tranquility in rustic Turkana style huts beside the lake are among my favorite Kenya experiences. I love Lake Turkana. Unconditionally. I spent an unforgettable two weeks here some years ago and didn’t want to leave. I’m not sure I’ve ever been anywhere wilder, more untamed, more unforgiving and more strikingly beautiful. It’s not a prime wildlife destination for sure, though there are crocodiles and hippos aplenty, desert Oryx, interesting birdlife and great fishing. It can be a very tough place to get to and it’s not the most stable part of Kenya either, but a large part of the lake’s appeal is found precisely in its isolation. Even some Kenyans seem to think that Turkana is in fact in Sudan. Lake Turkana is the largest desert lake in the world and also the largest alkaline lake. Standing on the sandy shore and looking out across the water it’s hard to believe it’s not an ocean. The unfailingly welcoming local Turkana tribe, whose fascinating culture is similar to the iconic Maasai but less tainted by Western tourism, call the lake the Jade Sea, which is testament to both its size and the beautiful jade colour of the water. 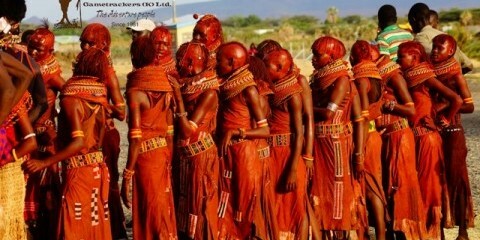 Turkana is not for the faint of heart and certainly not on most Kenyan safari itineraries. But for those looking to see a completely different side of Kenya it’s a truly special destination. This is not, in my view, primarily a wildlife destination, though you are likely to see the like of gerenuk, Beisa oryx and various dry-country birds including Somali ostrich on the long dusty drive there, while crocodile are plentiful in the lake itself. 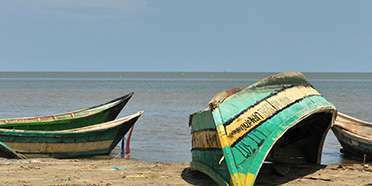 The main attraction is the remote windswept setting of this beautiful lake, a deep jade apparition that contrasts with the surrounding desert scenery, and the opportunity to interact with some of Africa’s most staunchly traditionalist tribes, among them the pastoralist Turkana and Samburu, and the El Molo community of fisherfolk. As of 2012, exploration for oil threatens to bring this remote wilderness firmly into the 21st century. So best catch it soon! Lake Turkana, the largest desert lake in the world, lies in the scenic Rift Valley in the very remote inaccessible part of Northern Kenya. Getting here means crossing the inhospitable Chalbi desert. This is not a place to include in just any Kenya safari; this is a destination and trip in its own right. Getting here and back, taking in some of the other attractions of Northern Kenya takes time and is only for people who don’t mind roughing it a bit and are up for some adventure. The wildlife is scarce, but all the expected desert creatures of this part of the world are present. These include gerenuk, dik-dik, reticulated giraffe and beisa oryx. The birding is excellent and you’ll be able to tick off some real desert specials. For me, coming to this part of Kenya isn’t primarily about the wildlife or scenery. Ancient tribes rule here and a little interaction with these incredible people has made for an unforgettable experience.